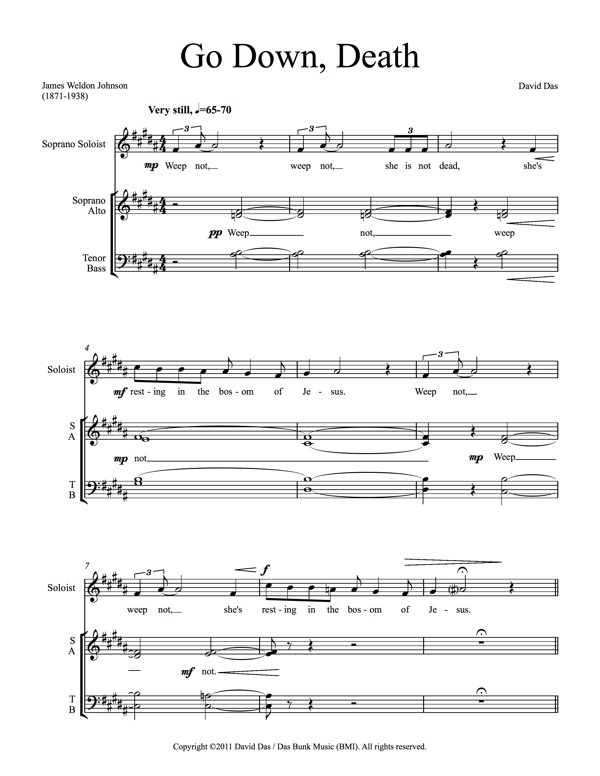 More than ten years ago, I began work on a new choral work based on a poem by American poet James Weldon Johnson (1871-1938) entitled Go Down, Death. This year, I got the chance to finish up this five-minute piece. And his eye fell of Sister Caroline. This piece, which has not yet been performed, follows the form of the original poem exactly, with a somewhat dissonant reflective introduction, and then a series of episodes at medium and fast tempos as the story unfolds, concluding with a return to the introduction to cap off the piece. In the faster adventure sections, I spent a lot of time writing the highly rhythmic inner lines to create minimalistic pulsing textures to propel the movement. The score of this composition is available for purchase for $9.99, which includes unlimited reproduction rights for one choir/conductor/director to perform the piece in a season. 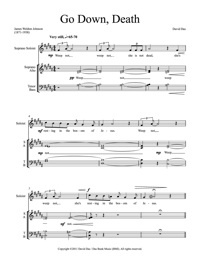 The first page of the score to Go Down, Death can be previewed for free by clicking the thumbnail to the right. If you are a choral director who would like to peruse the score for evaluation, please use the Contact page.